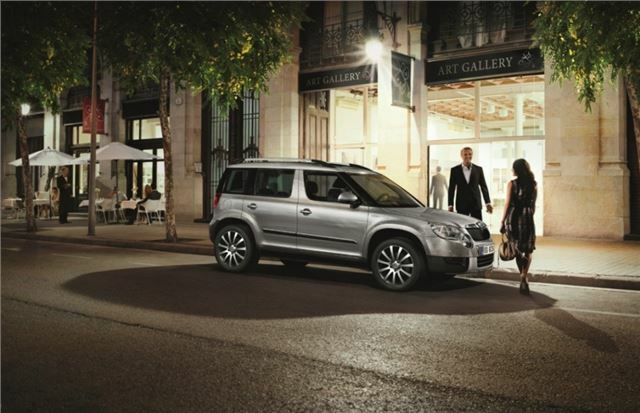 The popular Skoda Yeti line-up has been bolstered by the arrival of the new top-of-the-range Laurin & Klement model. It's based on the Elegance, but comes with more than £4000 worth of extras for £2000. The Laurin & Klement will only be sold as a four-wheel-drive model and is available with the 1.8-litre TSI 160PS, 2.0-litre TDI CR 140PS, and 2.0-litre TDI CR 170PS engines. Additional exterior equipment over the Elegance includes 17-inch Annapura polished alloy wheels, roof rails, and auto-dimming driver’ door mirror. Inside, you get Columbus satellite navigation with DAB radio, heated windscreen, panoramic sunroof, park assist, and piano black inlays to complement the black leather interior. There are further personalisation options for those who want just that little bit more, too. If you're not familiar with the Laurin & Klement name, in recent years, it's been used by Skoda to identify its flagship high specification models - but it's actually used in recognition to Václav Laurin and Václav Klement, the founding fathers of Skoda, who in 1895 started a company, and established it (in its earliest years) as being the manufacturer of some of the world's best cars. The Yeti Laurin & Klement is on sale now.